J: With our bellies empty and wallets full, Ed and I donned our tights and made the mad dash to Pizzeria Prima Strada. What was once a garage is now home to brick oven baked pizzas. It seems only fitting that the place which once tuned-up cars now services people. And that’s a good thing because we were both in need of more than a regular service. With the amount of greasy pizzas both of us had consumed in the past, Ed’s rear end shocks needed replacing and I felt like a beat up 58′ Ford Edsel. E: At this place, it’s not diesel that I’m smelling. I thought it was the roasted ceder planks coming from their oven as they prepared our Napoletana pizza. But thanks has to go to Prima’s Facebook team for pointing out that actually they use alder wood. Just like how they served sample slices back at the ICC fest we went to, nothing’s changed. I love the mix of garlic, anchovies and olive oil. And with the water buffalo cheese as an extra, it really complemented the anchovies. For its serving size, however, it’s barely enough to fill two empty stomachs, let alone one. I can easily finish off two thin crusts without a problem. And the crust is very soft at the center and crispy at the edge. J: There aren’t many places in Victoria where you can enjoy anchovies on your pizza. It seems to be a lost art on our tiny little island community but here at Prima, they have the touch of Michelangelo’s finesse in what they make. My Ginocchi pasta with morels in white wine was a delight. The potato pasta was nice and soft; it literally melted in my mouth like butter. I was deceived by my taste buds as I swear I tasted Parmesan inside each shell. The basil made for an alluring smell as it was delivered to me. E: I love wild mushrooms and had to sample a few. I thought the wine reduced some of the morel’s stronger, woody, flavour, but was still delicious all the same. On my pizza, it made for a nice addition to its already complex taste, but it wasn’t enough for me. One day, I’ll look forward to dining on a wild mushroom pizza. I can imagine at least four different kinds of fungi served on top of a thin crust. But in the meantime, I thought the wild green salad was very good. The powdered parmesan made a huge difference in how it tasted overall. The berry vinaigrette toned down the slight bitterness that’s often found in wild greens and in this salad, I barely noticed it at all. J: The vinaigrette and the parmesan were a great combo. It certainly livened things up. I must comment though on the great service we received. Our waiter was prompt, polite and good humoured. I didn’t feel deprived of anything. E: Other than you eyeing that waitress? That’s certainly something I saw you wistfully sighing about. J: I was also eyeing the gelato too, but it doesn’t mean I want it’s phone number. I enjoy various art forms, culinary is one and women the other. But I sure would have considered taking the chocolate gelato home. We would’ve been happy together and maybe even married. E: I’m not going to comment there, James. 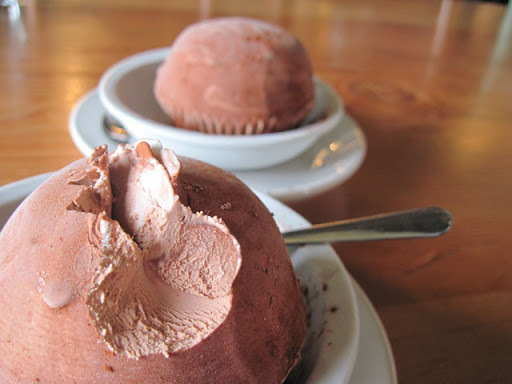 This Tartufo, as it’s properly called, was a bit too hard to dig into at first. But under the evening sun, it slowly melted to a nice silky softness. There were two layers, one was a chocolate hazelnut surface and within it, a vanilla flavoured core. Like in Return of the Jedi, you want to get to the Death Star’s core. That’s where all the fun is at. J: You might have an easier time if you were aided by a tribe of ewoks armed with spoons. E: Give me a spork and I’ll start raising a few rebellions. But in the meantime, I’ll be hitting the Prima again. I have to see what they do for their version of a meat lover’s pizza, and perhaps next time, just bus down and walk to here. There’s parking around the area, but it’s very limited. Since this place is the latest expansion for Prima (their original location was on Cook St.), I can only see good things in the future. 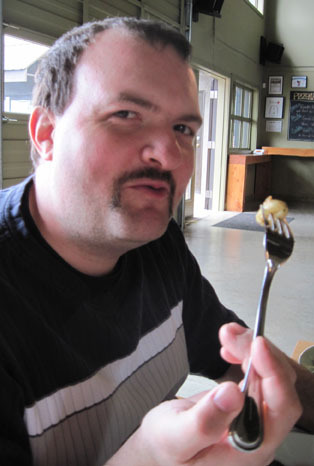 This entry was posted in Food, Reviews and tagged British Columbia, Pasta, Pizza, Vancouver Island, Victoria. Bookmark the permalink. We received a response from Prima on their Facebook and instead of just going in to correct the article, we thank the staff in pointing out that they use alder wood in their ovens.